Covenant Presbyterian Church is so happy & blessed to offer this multi-use garden for the enjoyment of our congregation and community. Go to Photo Gallery to view pictures of the dedication ceremony 4/22/12. This Memorial Garden is set aside because those who have died form the communion of Saints and are present in our prayers always. We hope that our garden offers a special place for personal reflection and prayer. We stand with all people to declare our Praise to God. A vision (below) led to the creation (above). God Still Walks in the Garden! “God Almighty first planted a garden. And indeed, it is the purest of human pleasures.” – Francis Bacon The Covenant Memorial Garden fundraising progressed toPhase II through the generous gifts of the congregation and friends of Covenant. The Clark family has been instrumental in fast-forwarding progress by donating a major gift in memory of Burk Clark, Sr. 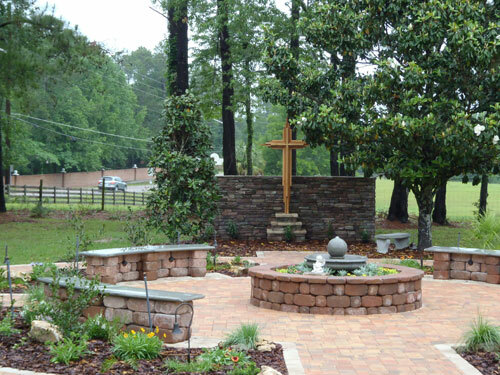 Faith Clark donated funds for the Faith Fountain, which was delivered September 6, 2011, and is the center of the garden design; other donations have been made by CPC members specifically for a magnolia tree, nine engraved bricks, two benches, and an 8-foot wooden cross. 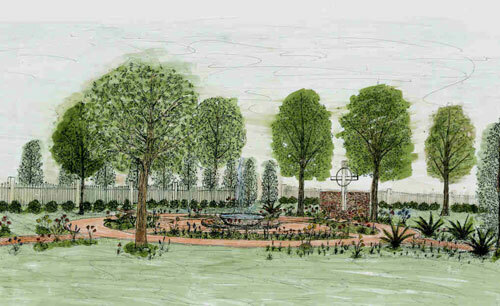 The congregation saw a PowerPoint presentation of the progress on September 4, 2011; the presentation can be viewed by clicking on the link: Memorial Garden Power Point The garden design is divided into three Phases. Phase I is the core garden area. Phase II is the handicap access ramp and walkway from the garden to the parking lot. Phase III is the 98th Street sound barrier. The infrastructure installation began in September, 2011 to include footers, underground wiring and sprinklers. Hard landscaping of pavers, lighting, installation of cross, fountain, benches and other masonry followed. And last but not least, surrounding trees and the plantings in the beds and around the raised bed encircling the fountain, completed Phase I. We thank committee members John and Ophelia Carver, Debbie and John Menoher, Faith Clark, Diane Felts, Pat and Harley Walker, Carter Wittman, Helen Rivers, Laura Joost-Kuhn and John Ebbs for their efforts and dedication. We have more work ahead of us, and ask for your financial support to see the Covenant Memorial Garden to completion so we can all start enjoying God’s gifts of nature. We the people of Covenant Presbyterian Church, dedicate this garden in the hope that it adds beauty to our world that is too often stark and unwelcoming. the garden says, “Come”, to those who find their way here. May this be a place where the gift of laughter will rise above our troubles, where treasured stories will be shared to make us wiser, where the pain of loss will be embraced with arms of hope and trust. Let us strive, always, to be God’s servants, healing and helping our world in any way we can….